Continuation from the previous 124 parts, the whole series can be found at http://www.nikoport.com/columnstore/. It is quite emblematic that this blog post is following the number 124 in the series – Columnstore Indexes – part 124 (“Estimate Columnstore Compression”), because this blogpost is a logical continuation of my original one, publishing the script of my CISL cstore_sp_estimate_columnstore_compression_savings, which supports any SQL Server version with Columnstore Indexes, as well as the Azure SQL Database. 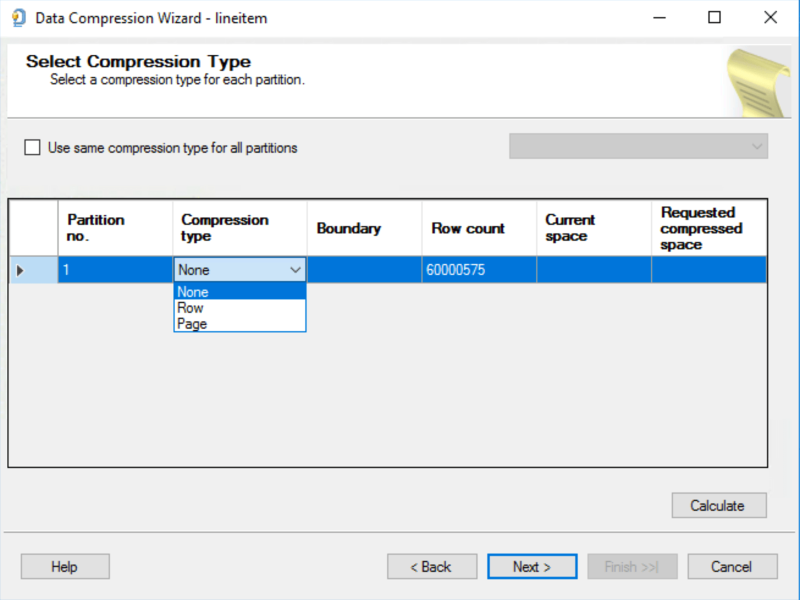 Just a couple of days ago, with the first public release of the SQL Server 2019 CTP 2.0, Microsoft has included a new version of the good old system stored procedure sys.sp_estimate_data_compression_savings that finally supports Columnstore & Columnstore Archival compressions. Another interesting issue with this procedure is that it is supporting Columnstore Indexes as a source, meaning that if you are creating a regular Rowstore Compression – you will be limited by the 32 columns, just in a regular Rowstore case. I have picked a 10 GB version of the TPCH test database for the purpose of testing and it is a generated copy that can be done with the help of HammerDB (free software). Continuation from the previous 98 parts, the whole series can be found at http://www.nikoport.com/columnstore/. I decide to dedicate a whole blog post on this matter, mainly to warn people of this pretty problematic statement – I hope not to see it being used for Columnstore Indexes in the future! MERGE T-SQL statement has a huge number of bugs and potential problems with some statements delivering incorrect results or being canceled – for the details I recommend that you read Use Caution with SQL Server’s MERGE Statement where Aaron Bertrand went into the details of why one should strive to avoid using this statement. You might point that a couple of years ago, I have already published a blog post on the dangers of using UPDATE statement for the Columnstore Indexes, but as I keep seeing MERGE statement on the production servers, it is clearly deserves an own post. As in the other blog post I will be using the a generated copy of the TPCH database (10GB version this time, because I want my tests to reflect bigger workloads), that I have generated with HammerDB (free software). On the image above you can clearly see the results pointing towards 2.5 GB of the total size of the expected Columnstore Index, and with just 10 seconds spent – this is a brilliant results, I have to say. What raises me both of my eyebrows are the used sample – 40MB of the original sample size with the current compression setting (NONE) and the 10.7MB for the Columnstore compression. Besides providing much more information (sampled rows, %, and the Trimming reasons, etc), options (such as DOP, sampled table persistence, etc) the default usage in this case took a whooping 44 seconds! But most importantly if you look at the estimated results, it will show you that the 4.3 GB is the expected size of the compressed table – which is a huge difference to the original estimation by the sys.sp_estimate_data_compression_savings System Stored Procedure in SQL Server 2019. We are talking here about good 40% of the difference in the estimation and when we are talking about big tables for the Data Warehousing – this can be a crucial factor, in my experience. This is why I have included a parameter to control the number of sampled rows (and by default it is 4 Row Groups – meaning 4.182.712 rows. The SQL Server Management Studio (in short SSMS) that accompanies SQL Server 2019 CTP 2.0 release is SSMS 18.0, and even though I am becoming a lesser fan of it (think all missing Columnstore Features, Mirroring, AG, Stored Procedure, etc, etc bugs), I still try to use its features in order to be able to share with the clients what they can and what they can’t do). For the purpose of testing the SSMS support of the sp_estimate_data_compression_savings, let’s select the lineitem table from the TPCH 10 GB database, as previously by right clicking on the table name at the Object Explorer, select Storage Menu and selecting “Manage Compression” further. At this point we shall arrive to the screen where we can select partition(s) and corresponding compression type – NONE, ROW, PAGE … and nothing else … There is no way to select COLUMNSTORE or COLUMNSTORE_ARCHIVE compression levels and hence no way to calculate the estimated improvement for the application of the Columnstore Indexes, and while it is reasonable that SSMS is always a couple of steps behind of the SQL Server Engine, a huge number of users who are following visual guide of the GUI will be quite disappointed, and given the lack of the basic Columnstore Indexes functionalities in the SSMS – I see a frightening tendency, rather then the exception. I do hope & expect this to be solved by the final release of the SQL Server and hopefully this will support SQL Server 2014+ for the very same purpose. I do not see any magic sauce in the addition to the sys.sp_estimate_data_compression_savings stored procedure and as I told many moons ago – we need this to be backported to SQL Server 2014, 2016 & 2017. With so many examples of great backports lately from the SQL Tiger team, it should be pretty much no brainer to include this in a CU or maybe even in a Service Pack (yeah, for the SQL Server 2017 this will have to be a CU, I know :)). So many people will profit from this improvement, without having to use additional downloads and installations, without having to explain what this function does or how much was paid for it (nothing, its free) and how much it is supported (as anything free) – I am really grateful for this little but important implementation. Everyone is quick to point out that MERGE has some bugs. Is it really that bad? It always worked fine for me. I understand the egregious bugs are long fixed in recent SQL Server versions. I have already hit multiple bugs in the production. I do not believe that all of them are solved, there are simply mitigations and alternative solution paths, and that’s the reason that Microsoft does not hold them to the highest priority. That’s terrible. MERGE is such a useful concept.